2.1. 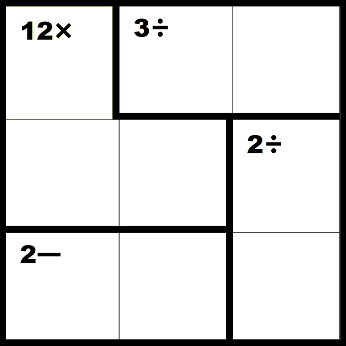 This KenKen involves multiplication, division and subtraction. What do the four corner cells add up to? Look at the (12x) cage. It can only contain the numbers (3, 2, 2), but the 2s cannot be in the same row or column, so where must they be placed? 2.2. 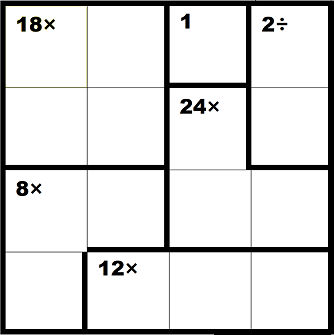 This KenKen involves multiplication and division only, but it’s a 4x4 grid. Okay, this is harder than I thought. Of course, fill in the freebie (1). 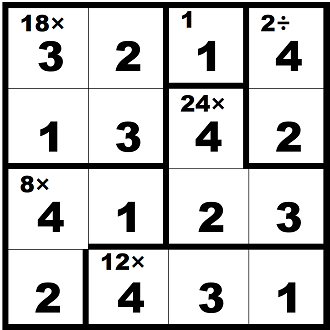 Then, the (18x) cage has to be (3, 3, 2, 1). 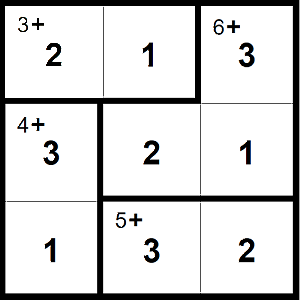 The (3, 3) have to be diagonal to each other in the cage, to avoid being in the same row/column. 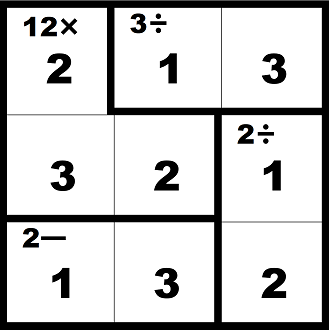 Therefore, the (2,1) have to be diagonal to each other – one is in the top row and one is in the second row. In fact, the 1 has to be in the second row, because we already have a 1 in the top row. So, the 2 has to be in the top row. So, in the top row, we know we have a 3 and a 2 in the (18x) cage, and then a freebie (1), so the right cell in the top row must be (4). 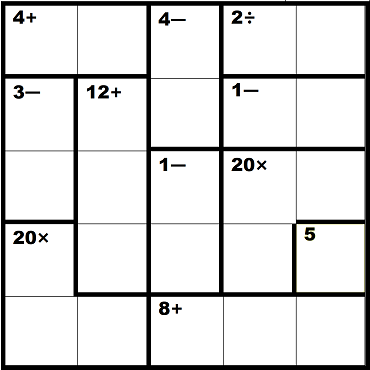 If the top right cell is (4), from the first hint, the cell below it must be 2. The cell below that is part of the (24x) cage, which consists of (4, 3, 2). However, the right-hand column already has a (4, 2), so the third element of the right-hand column must be (3). 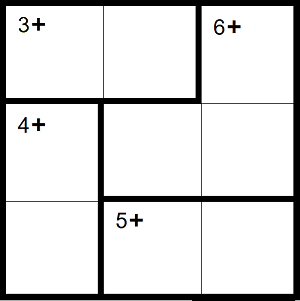 3.1 This KenKen involves only addition and subtraction, BUT it is a 5x5 grid! The (4+) cell has to contain (3,1) in some order, as (2,2) is not allowed, because you cannot repeat any number in the same row/column. The (12+) cage must have three different numbers, because it sits in one column. Those numbers must be (5, 4, 3). 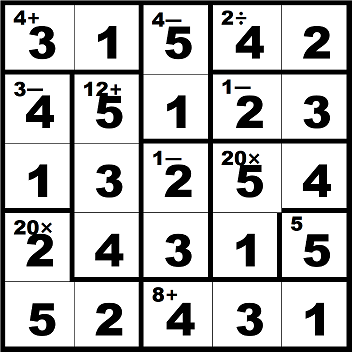 The first hint showed that the (4+) cage must be (3,1), and now we know it must be in that order to avoid a repeated (3) in the second column. Don’t worry if you needed all four hints – this is not an easy KenKen. Two clues in this hint. (1) In the (12+) cage, which must contain (5,4,3), the 5 must be at the top of the cage to avoid being in the same row as any other (5). (2) This forces the last (5) into the bottom-left corner.